Barry McNamee scored Cork City's equaliser in their 4-2 comeback victory in the President's Cup at Oriel Park on Sunday afternoon. The new League of Ireland season kicked off with a bang at Oriel Park on Sunday afternoon as Cork City stormed to their third successive President's Cup final win over Dundalk. Ronan Murray's first-half double looked set to give the hosts their first victory over the Leesiders since October 2016. However, the reigning champions produced a scintillating second-half display with Karl Sheppard and Barry McNamee drawing them level by the hour mark. Kieran Sadlier's wonder strike put them ahead and Dundalk's capitulation was summed up when Graham Cummins headed home a Sadlier cross with nine minutes to play. Both clubs made significant changes over the winter months, highlighted by the fact that 12 of the players on show didn't start the FAI Cup final meeting between the sides last November. 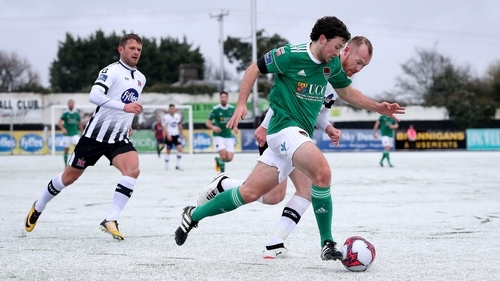 The heavy snow that subsided before kick-off returned as the game got underway and Dundalk deservedly pulled in front in the 19th minute. Michael Duffy's ball in from the left wasn't cleared and Murray was on hand to skim the ball into the far corner. The former Galway United man did more damage five minutes before the break, collecting a ball from the left again to lift a close-range effort over Peter Cherrie from close range. New recruit Barry McNamee made it 2-2 nine minutes later when he headed home a Sadlier cross from the left and Oriel Park was stunned when Sadlier himself rifled an unstoppable effort into the top corner of Rogers' net with 11 minutes to play. Dundalk never looked like getting back into things and Cork extended their unbeaten run over Stephen Kenny's side to seven games thanks to Cummins' near-post header to seal a victory that suggests they will still be the team to beat in 2018. DUNDALK: Gary Rogers; Georgie Poynton, Sean Hoare (Robbie Benson 38), Stephen Folan, Dane Massey; Chris Shields, Krisztian Adorjan (Patrick Hoban 67), Jamie McGrath; Dylan Connolly (Jack O'Keefe 88), Ronan Murray, Michael Duffy. CORK CITY: Peter Cherrie; Colm Horgan (Steven Beattie HT), Alan Bennett, Aaron Barry, Shane Griffin; Conor McCormack, Gearoid Morrissey (Conor McCarthy 90), Jimmy Keohane (Karl Sheppard HT), Barry McNamee, Kieran Sadlier (Sean McLoughlin 90); Graham Cummins (Tobi Adebay-Rowling 90).